The Buddha taught in different ways to different people at different times. As a result, different traditions have formed. The two main traditions are Theravada and Mahayana. Both share the common basic teachings of Four Noble Truths and the Eight-fold Path. One tradition is not any better than the other; both seek for enlightenment, but their approach is different-- so is their location. Theravada Buddhism is common in Sri Lanka, Thailand, Miramar, and Laos. Mahayana Buddhism is found in Tibet, China, Japan, Korea, Vietnam, and Mongolia. It includes Japanese Zen, Chinese, Tibetan, Korean and Vietnamese Buddhism. Theravada follows the first teachings of the Buddha. The goal is to become an Arhat—an enlightened one--but not a Buddha. Only a monk or nun can be an Arhat, but through long hours of meditation and personal discipline. Theravada Buddhists revere Gautama or Buddha Shakyamuni, the Buddha of this eon. They also accept Buddha Maitreya as the future Buddha. The teachings are written in Pali and are known as the Pali Canon, or suttas. The most popular is the Metta Sutta on loving-kindness. There are two Theravada traditions: the village monastery and the Thai forest tradition. Village monasteries are places of ceremony, prayer, community events, education and medicine. 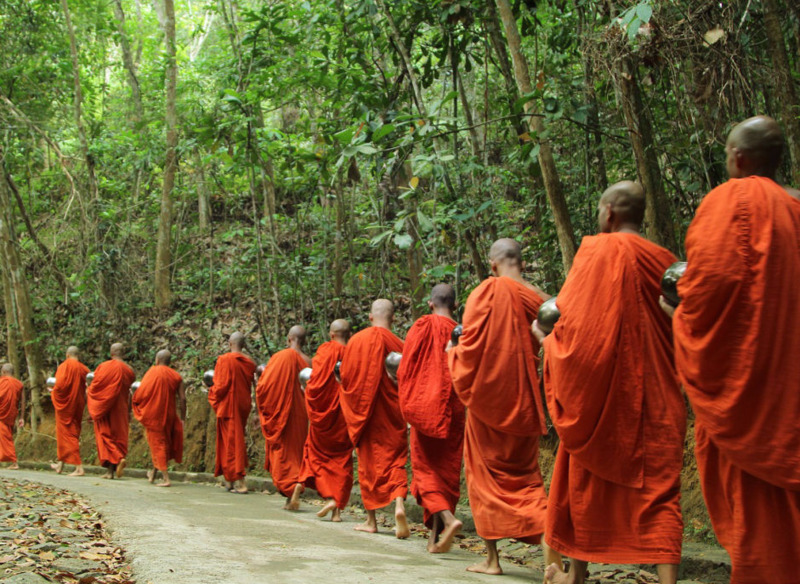 The Thai forest tradition is a life of ascetic wandering and meditation practice in the wilderness. Mahayana focuses more on the newer teachings of the Buddha. The goal is the Bodhisattva Path--not only seeking enlightenment for oneself, but the enlightenment of all beings. One who engages in this path is called a Bodhisattva. The path includes more than meditation and personal discipline, but selfless service and working in the world for the benefit of others. Mahayana Buddhists believe that there have been many Buddhas in the past and that more will appear in the future. According to the Buddha’s teachings, all beings have the Buddha nature and can become Buddhas. Anyone can embark on the Bodhisattva Path of compassion and reach the state of Buddhahood in this very life—monks and nuns, as well as lay Buddhists. Mahayana teachings are written in Sanskrit and called sutras. The most well-known sutras are the Diamond Sutra, the Flower Garland Sutra, and the Lotus Sutra.